The Column chart and the Stacked Column chart both display data using rectangular bars where the length of the bar is proportional to the data value. However, in the Column chart, data values are displayed side-by-side whereas in the Stacked chart, they are stacked one over the other. Let’s see the optimum usage of both these charts. 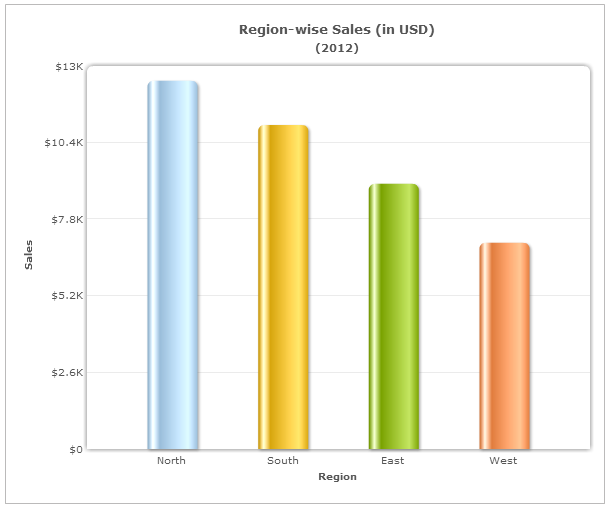 Say you want to compare your region-wise sales for 2012. A Column chart can easily facilitate that comparison. But what if you also want to show the quarterly contribution from each region? In such a scenario, the Stacked chart is very helpful as it can facilitate both comparison as well as part-to-whole relationship. 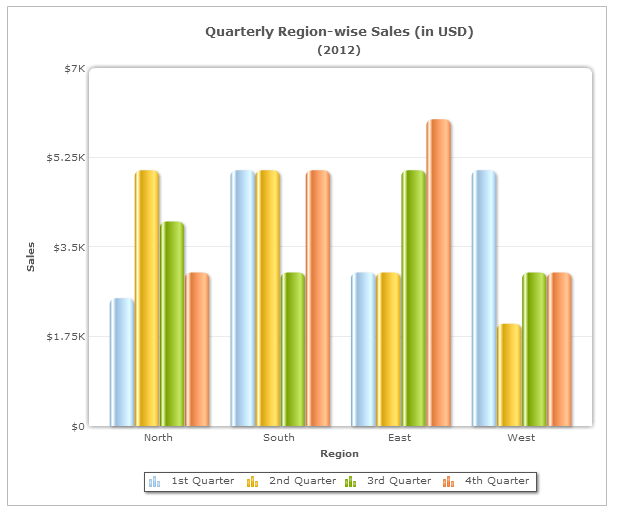 From the Stacked column chart above, you can not only compare the sales of each region but also analyze the breakdown of each regional sales into its constituent quarters (part-to-whole). The Stacked chart is effective as it can visually aggregate the parts of a whole. Data interpretation using a Stacked chart becomes difficult when you want to compare the constituent parts of each entity across the various entities. 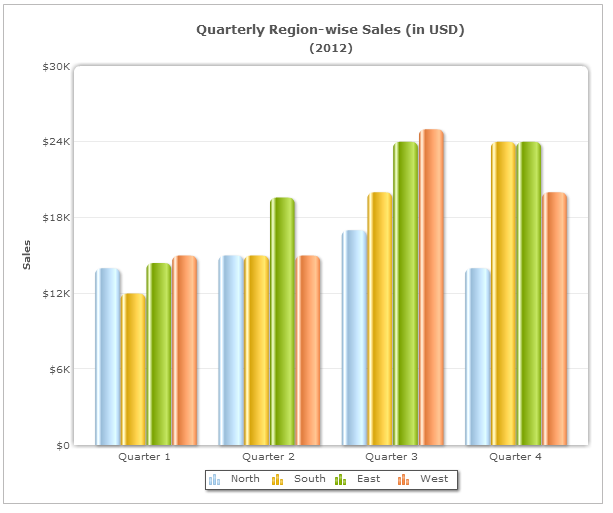 Try comparing the 2nd Quarter sales across the regions from the above chart! To facilitate such analysis, we can use the Grouped Column chart. When several Column charts come together and are placed side-by- side so as to form individual groups, they are called Grouped Column charts. In the Grouped Column chart, all the columns have the same baseline and thus it is much easier to compare the heights of the individual columns. To further make the analysis easy, bring those columns closer that are to be compared. The more the proximity of the columns that are to be compared, the easier it is to compare them. In this chart, we have brought the quarterly sales of each region closer so as to form four groups―North, South, East and West. You can easily compare the sales of North across the four quarters from this chart. On the other hand, in this chart, the sales of the regions North, South, East and West form four groups―Quarter 1, Quarter 2, Quarter 3 and Quarter 4. 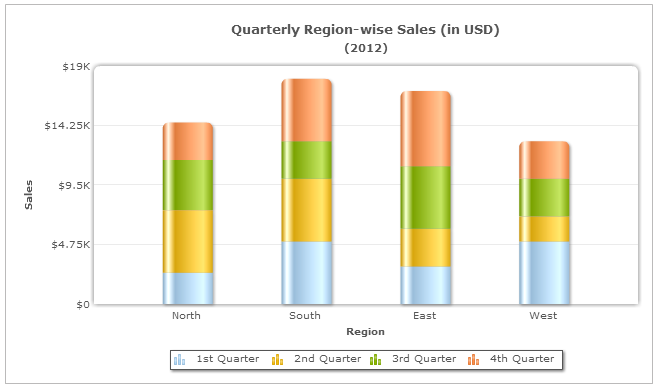 It is easy to compare the sales of each region within a group (quarter) due to their proximity with one another. To sum up, while the Column chart can be used to facilitate all comparison-based analysis, it is better to use the Stacked Column chart when you want to show part-to-whole relationship (along with comparison). Keep watching this space for more tips on charting best practices. Business tricks they don’t teach at B-Schools – How to report poor performance and get away with it?